My name is Svetlana. I learn English every day. I am learning English now. I have learnt some English already. I have been learning English for ten years. If I hadn’t been so lucky I would have never had a chance to learn English. Even the gorgeous Present Perfect Progressive have I mastered, and the mysteries of the nebulous Subjunctive Mood, too, as you can well hear, without ever having visited London, which is the capital of Great Britain and stands on the river Thames. As for me, I don’t mind an hour’s ride to school in a bursting trolley-bus because I am fortunate to go to the only school in the town where English is taught from the first class. Maria Ivanovna, the town’s premium teacher of English, reigns there. We are all in awe of her. She makes us meek and silky just with the glance of her bespectacled eyes. Maria Ivanovna takes a syringe and injects a dose of success right into our assiduous bottoms. She says, ‘Don’t you dare come to see me in ten years unless you are driving a black Mercedes, working in the Ministry of Foreign Affairs and own an apartment in Moscow’. I am jealous of Maria Ivanovna’s jewels, the more so because I know that I myself could get rubies like this by right of inheritance, but I never will. They say my great-grandmother Celia was married to a rich merchant in Odessa. She was an illustrious beauty. She spoke five languages, had relatives in London and never condescended to wearing such vulgar jewels as rubies. Even to the market place, accompanied by her kitchen-maid and a drunkard hired for a kopeck to carry the heavy baskets, she chose the best vegetables and chicken for a Sabbath meal wearing no less than diamonds the size of cherries. I gaze at Maria Ivanovna in scarlet glow and imagine myself not in a black Mercedes, not in the ministry of foreign affairs and not in a flat facing the Kremlin. In my dreams I go to London, step on to a boat on the river Thames and meet a whiskered young lord whose accent is the finest RP. We fall in love and marry and live in his castle with a ghost. To the ghost I also speak in my own finest RP. When asked how I had obtained a place, my mother always said, ‘it was your fortune, there was that one last place left’. I finished school and tried to catapult myself into the longed-for perilous world. The concrete curtain fell and the cord of fate connecting me with Maria Ivanovna was cut. Last Sunday I was marking the exercise-books and cursing loudly when the doorbell rang. A man with a concrete-like greyness about him was standing at my doorstep. I had never seen him before. ‘Is your name Svetlana?’ he asked me in my home town vernacular. ‘Yes it is,’ I answered, surprised. ‘I was asked to hand you this,’ he said, and gave me a plastic bag. Before I could open my mouth he vanished into the dusk of the hallway. I learn English every day. I am learning English now. I have learnt some English already. I have been learning English for thirty years. Even the gorgeous Present Perfect Continuous have I mastered and the mysteries of the nebulous Subjunctive Mood as well. Had it not been for my mother, who had spent the spookiest hour in her life in my teacher’s bathroom locked from outside to offer her the only family treasure, I wouldn’t be struggling for words to tell you this story now, wearing ruby earrings the size of peas. Svetlana Lavochkina. Photo courtesy of the author. Svetlana Lavochkina is a Ukrainian-born writer of fiction and translator of poetry. She has lived in Leipzig for 16 years, having come to Germany as a Jewish refugee. Her fiction and poetry translations appeared in numerous literary magazines in the US, UK and Europe. In 2013, she was one of the three prize winners of the Paris Literary Prize, an international novella contest run by Shakespeare and Company and the De Groot Foundation. In 2015, her novel “Zap” was chosen finalist in the Tibor&Jones Pageturner Prize, London. 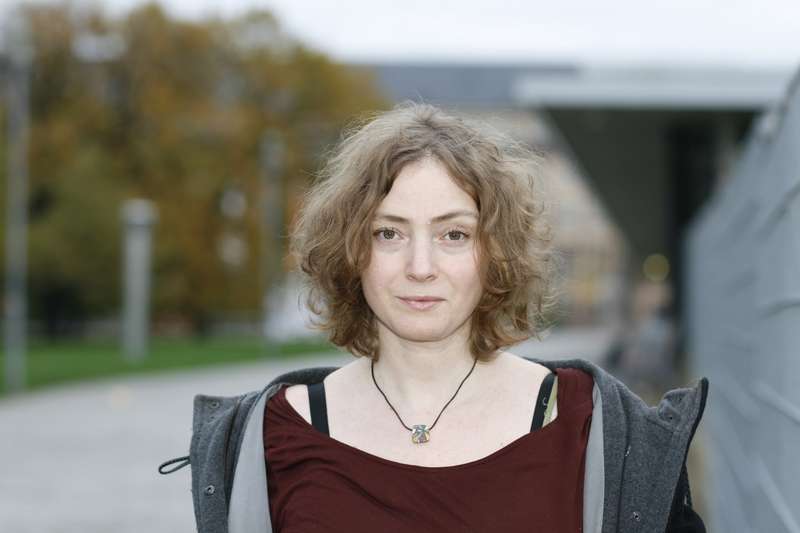 Svetlana is co-founder and former president of Leipzig Writers e.V. Find out more about her via her Facebook page and Web site.